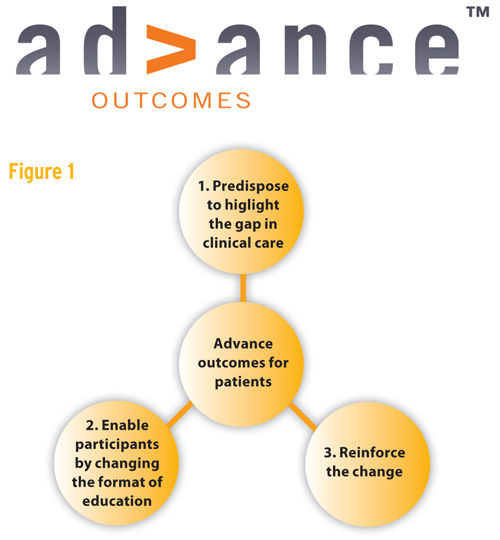 Predisposing: this identifies people ready for change and begins to highlight the gap in their care that the training will address. Enabling: this ensures that any intervention (eg lecture, workshop) addresses benefits and barriers to change, allowing peers to work together to understand how they can make the change. It also identifies tools that participants can use to help them make the change when they are back in their clinics. Reinforcing: this is a planned intervention where participants are reminded of the need to make the change and are encouraged to share their experiences. It keeps the education front of mind (see figure 1). Imagine there is new evidence which suggests that accurately determining disease severity at diagnosis in patients with psoriasis improves patient outcomes, as the most effective therapies can be used from the outset. You might plan a meeting designed to support clinical leads in making this change in their department. Survey patients attending their clinic asking how often they have their disease severity measured. None of the above is perfect, and the list is not exhaustive, but raising a participant’s consciousness about the need to change before he comes to an educational event makes him more receptive to the education delivered. Use of audio-visual aids eg holograms. It is also critical that you enable your participants to discuss the benefits of making the change and the barriers they perceive (preferably with someone who has already changed their practice). Finally, think about tools and tips that participants can take away to help them change when they return to their clinic. Conducting a follow-up audit or survey. While there is a growing body of evidence that the way we educate needs to change, we still deliver one-day, plenary-heavy meetings. As an industry, if we want to support education that advances outcomes for patients we need to look at education more holistically, and support participants for the entire journey.